I joined Saltire Thistle four years ago after seeing posters advertising the team in gay bars around Glasgow. The idea of a gay-friendly football team intrigued me – I had always played football growing up and although I was still playing regularly at the time, I was finding myself falling a little bit out of love with the sport as I felt that I had little in common with the guys I was playing with. Eventually I made contact with the team and was invited down to a training session. Although I was quite nervous initially, everyone made a big effort to make me feel welcome and I started to enjoy my football again. Playing in the GFSN league against other gay-friendly teams from around the UK has been a fantastic experience over the past few years and we also play in a local Glasgow league. Sometimes results might not go our way, but the team has a competitive spirit and we are not beaten easily. On a personal level the club has had a significant effect on me. Meeting other gay people with similar sporting interests was not something I would have expected. The result is that I became more confident in myself and more secure in my sexuality. The club is very involved in the local gay community and enjoys the support of an extensive and eclectic mix of people (The Saltire Thistle Ladies Guild) which led to me expanding my social circle even further, beyond just football. Before I joined the club I never really spent much time in the gay community as I felt that I would not fit in, but I have realised that I could not have been more wrong. 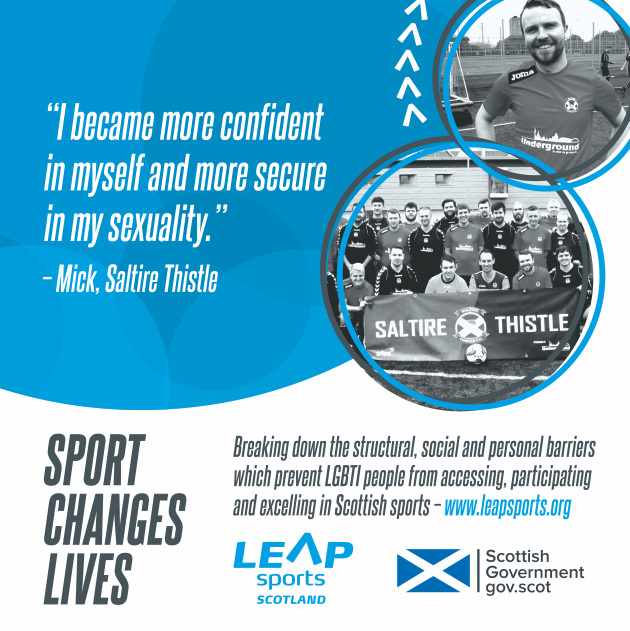 Saltire Thistle FC are the West of Scotland’s LGBTI friendly football team, based in Glasgow. We play competitive weekly football in the GFSN and Glasgow Community and Cooperative Leagues. We are always looking for new members irrespective of sexuality, gender or background. Written on 12th January 2017.